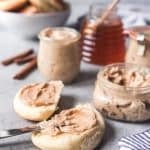 Whipped Cinnamon Honey Butter takes your bread, biscuits, muffins, and rolls to the next level! It also makes a perfect edible food gift for the holidays! Beat the softened butter until creamy and smooth, about 2 minutes, in a large bowl with a hand mixer or in the bowl of a stand mixer fitted with the paddle attachment. Add the remaining ingredients and beat again until smooth. Transfer to jars or other storage containers. Serve at room temperature.